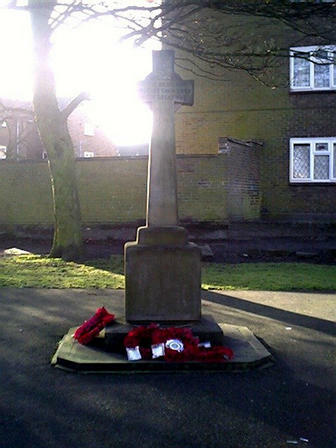 This memorial commemorates men of the First & Second World Wars and also the memory of five civilians killed by enemy action 1939-45.The Memorial is located on Deans Road at the junction of Tyburn Road Deansfield. The plaque reads- "In Memory of Civilians Killed by Enemy Action 1939-1945"
JOSEPH RICHARD DUDGEON age 58 Firewatcher. Husband of Amy Ellen Dudgon, of 539 Willenhall Road, Moseley Village. Died 31 July 1942 at Wolverhampton Road, Willenhall. ADA ELSIE SOUTHAN age 48 of 191 Willenhall Road. Daughter of Arthur Edward and Louisa Reed, of 163 Willenhall Road; wife of Ernest Southan. Died 31 July 1942 at Willenhall Road shelter. ERNEST SOUTHAN age 51 of 191 Willenhall Road. Son of the late Mr. and Mrs. John Southan, of Foresters Arms, Oxford Street, Wednesbury; husband of Ada Elsie Southan. Died 31 July 1942 at Willenhall Road shelter. Daughter of Lily Wilcox of 197 Willenhall Road, and of the late Charles Cornelius Wilcox. Injured at 197 Willenhall Road; died the same day 31 July 1942 at The Royal Hospital. Son of B. Bowler of 96 Deans Road Heath Town. Died 2 August 1942 at Rowlands Avenue Heath Town. The inscription reads: "To The Memory Of The Brave Men Who Gave Their Lives In The World War 1914-1918"
Son of Mrs. Agnes Andrews of 18 Chapel St. Moseley Village. YPRES (MENIN GATE) MEMORIAL Panel 35 and 37. Husband of Clara Jane Cassidy (formerly Bate), of 3 Lilley St. Hemsworth Wakefield. Served in the South African Campaign. POZIERES MEMORIAL: Panel 52 to 54. Son of Joseph Beckett, of Dean's Rd., Moseley Village. Son of William and Mary Ann Bills of Moseley Village Heath Town, husband of Martha Helen Bills of Newbold Villa Deans Rd Heath Town. Grave Reference: V. E. 26. Grave Reference : XXI. FF. 7. Son of John and Harriet Burns; husband of Louisa Burns, of Melton Place, Moseley Village, Willenhall. KIRKEE 1914-1918 MEMORIAL : Face 11. Son of Henry and Ann Maria Colley of Willenhall Rd Moseley Village Wolverhampton. Grave Reference: VI. G. 25. Son of Thomas Cooper, of 34, Dark St., Mosley Village. Grave Reference: I. B. 1. Husband of Lily Rhodes (formerly Eastelowe), of 55 Coventry St, Willenhall Rd, Wolverhampton. Son of Charles and Mary Jane Edwards of 1292 Willenhall Rd Wolverhampton. Son of George and Annie Fletcher, of Willenhall. STRAND MILITARY CEMETERY Grave Reference: VI. A. 11. Son of Mrs. Martha Francis of 2121 Chapel St., Moseley Village Wolverhampton. formerly 36327 South Staffordshire Regiment. Grave Reference: I. J. 51. Son of E. A Ford (formerly Hill) of 71 Willenhall Rd. Moseley Village Wolverhampton, and the late Thomas Hill. Grave Reference: NG. 10. 31. Son of Mrs. Jane Ann Johnson of 26 High St. Moseley Village Heath Town Wolverhampton. Grave Reference: P. III. F. 8B. THIEPVAL MEMORIAL Pier and Face 7 B. Grave Reference: OG. 13. 24. Grave Reference: V. M. 15. THIEPVAL MEMORIAL : Pier and Face 10 C 10 D and 11 A.
LIEVIN COMMUNAL CEMETERY EXTENSION Grave Reference: I. D. 10. DANTZIG ALLEY BRITISH CEMETERY, Grave Reference: II.A.3. Grave Reference: IV. C. 68. Son of David and Emma Parsons, of 15, High St., Moseley Village. Grave Reference: OG. 8. 36. Grave Reference: OG. 10. 9. TEHRAN WAR CEMETER. Grave Reference: IV. C. 3. BELLICOURT BRITISH CEMETERY. Grave Reference: II.L.1. 1st Bn. Royal Warwickshire Regiment Formerly 16763 South Staffordshire Regiment. Aged 29. Died of Wounds 17 October, 1916. Son of David and Emily Spencer of 3 Cross St, Moseley Village, Wolverhampton. Brother of Mrs. Rose Bullock, of 37, Dark St., Moseley Village. Son of Charles W. and Sarah Ann Tonks, of "Ferndale" The Manor, Staffs. ETAPLES MILITARY CEMETERY Grave Reference: VI. C. 10A. TYNE COT MEMORIAL: Panel 72 to 75. The inscription reads: "To The Memory Of The Brave Men Who Gave Their Lives In The World War 1939-1945"
Son of Enoch and Amelia Cooper, of Heath Town, Wolverhampton. Grave/Memorial Reference: Old ground. Row 38. Grave 63. Son of Robert and Jane Badger, of Wolverhampton. Son of Ernest and Elizabeth Griffiths; husband of Mary Jane Griffiths, of Wolverhampton. Grave/Memorial Reference: 1. G. 11. Husband of Annie Cross, of Wolverhampton. Son of Mr. and Mrs. J. C. Slater, of Wolverhampton. Grave/Memorial Reference: XVIII. H. 18. Grave/Memorial Reference: Old ground. Row 14. Grave 5. Son of William Henry and Edith Anne Taylor; husband of Lily Taylor, of Quinton, Birmingham. Son of John and Sarah Lockley; husband of Mary Lockley, of Portobello, Staffordshire. Grave/Memorial Reference: XV. A. 21. Husband of Mrs. G. F. Bullock, of Heath Town, Wolverhampton. Grave/Memorial Reference: Old ground. Row 51. Grave S/2. Son of William and Maria Harris, of Wolverhampton; husband of Gladys May Harris, of Wolverhampton. Grave/Memorial Reference: Old ground. Row 51. Grave S/4.